The stunning and dramatic final book in the Kincaid brothers' trilogy set in the wilds of Scotland. Derryth MacClaren is on the run—having been sent from her castle home to avoid capture by the vicious nobleman known as the Wolf, who has vowed revenge against the Clan Kincaid. When a surprise attack leaves her vulnerable, Derryth ends up in the hands of an enemy warrior who claims her, with the Wolf’s blessing, as his prize. But her captor’s gentle words and touch seduce her heart—and body—completely. . . and when she discovers the tattoo on his arm that proves him to be the legendary, long-believed dead son of the murdered Laird of Kincaid, Derryth knows she must find a way to alter his fate—and her own. . .
Cull has no memory of his family or past—all he knows is the life of a warrior, trained to fight on behalf of the Scottish king. But now that Derryth has informed him of who he really is—Cullen Braewick, the youngest son of the slain laird—he is torn. If Cull exacts revenge against the Wolf, who executed his father, he stands to lose the precious lass who he has come to love. What is he willing to sacrifice for Derryth to keep her safe. . .and in his arms? 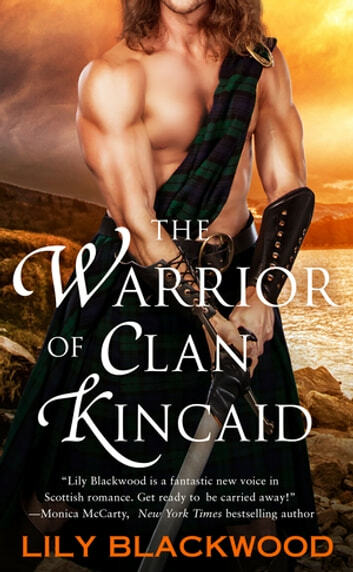 The Warrior of Clan Kincaid by Lily Blackwood is not one to miss! The Warrior of Clan Kincaid is the first Lily Blackwood book I've read but it definitely won't be the last. I have a soft spot for historical novels featuring Scots so maybe I"m a bit biased but overall this was an excellent read. The main characters (Cull the Nameless and Derryth) were interesting and their chemistry was off the charts. From the very first page I was sucked into the story. I definitely did not see the twist coming at the end. Lily Blackwood definitely goes on my "favorite authors" list. Rescued from slavery, Sir Cull the Nameless repays his benefactor by becoming one of the Kings own guard and his best and most trusted warrior. He hopes soon to win the right to lands and a family of his own. Derryth MacClaren is not happy about being sent to safety when trouble arrives. Unfortunately the route they take is the wrong one. Our heroine is a lot stronger than she believes. Our hero has suffered all his life and will soon discover the ulterior motives behind it all. An exciting highland adventure, full of great characters. A wonderful story that pulls together all the magic of a historical romance. A lost brother who does not remember who he is and has been living another life. A sweet heroine who figures out his identity and only wants to help him. Secrets, betrayal, deep emotions and truths that have been hidden that come to the surface. Yes, perfect!! Derryth MacClaren is sent away from Inverhaven of Clan Kincaid, where she has been living with her sister, to seek safety in case the castle is attacked. Traveling disguised she and her companions are captured by the enemy they were trying to avoid. Cull the Nameless, a member of the King's guard saves her from being abused by his men. He had been raised without remembering who he was since a young age. Taken in by Buchan, known as the Hawk, he has been raised as a warrior and part of the enemy of Clan Kincaid. Therein the story begins with the emotions that begin to spill over between Cull and Derryth. Lily Blackwood has brought history alive with strong characters that move this plot quickly along. I was not able to put it down until the last page was turned. This has been an amazing series that will be remembered and read again. I received an advanced reader’s copy of this book. This story captured my attention and held it throughout. Cullen, the hero, is honorable despite his background. Derryth, the heroine, is spoiled and seemingly weak at the start, yet I feel she discovers her inner strength and courage though her captivity. Cullen’s love for Derryth leads him to rethink his life and what he wants out of it. There are significant obstacles to their being able to get together and have their HEA. The book had a satisfying ending and it had great pacing throughout.